Israel is seen as a society beset by seemingly insurmountable obstacles, challenges and threats. Based on what we see and read in the media, life in the “promised land” would seem to be unlivable. But on the streets of Tel Aviv, Jerusalem and Haifa, there is a palpable insouciance and joie de vivre in the bustling shops, sidewalk cafés and residential neighbourhoods. Newspaper headlines scream of a possible Israeli strike against Iran to cripple its nuclear program. There is real concern about Syria’s stockpile of chemical and biological weapons. The once-quiet Sinai, under the new regime in Egypt, is reported to be pocked with extremists poised to unleash terror on Israel. 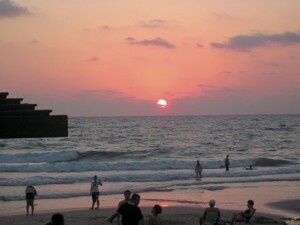 But in the Israel we saw during a two-week visit last month, residents were smiling, talking, reading, swimming, laughing, building, studying and working in a vibrant post-modern, post-industrial, knowledge-based society. The country is thriving. When I first visited in 1960 they were using cut-up newspaper sheets as toilet paper in prosperous Kibbutz Ein Harod. In 2011, Israel’s per-capita gross domestic product was about $31,000, according to the World Bank. Skyscrapers are sprouting all over Tel Aviv and construction cranes dot the skyline as you drive south along the coast from Haifa. Such hi-tech leaders as Intel, Google and Microsoft profit from an educated workforce, employing hundreds of graduates in research, assembly and quality control. Israelis don’t live in fear of terrorism any more—Gaza is sealed, Israeli’s advanced intelligence systems and the separation wall/fence have been effective, and, according to Israeli Prison Service figures as of July, 4,423 Palestinians were in Israeli jails, serving a sentence or under detention. The country’s prodigious economic success does not diminish the broad range of problems the country faces, not the least of which is its continuing quest for acceptance and legitimacy among its neighbours, the Arab minority in the country and those in Gaza and the West Bank. They, in turn, yearn for sovereignty. A report by the National Insurance Institute in 2008 indicated that roughly one-fifth of Israeli families lived below the poverty line. Poverty strikes hardest at Arab Muslim and Haredi, or ultra-Orthodox Jews. The reason, according to the Bank of Israel, is that 60 per cent of ultra-Orthodox men don’t work. Among Israeli Arabs, 27 per cent of the men and 70 per cent of the women don’t work in remunerated positions. There is more to this story than statistics: Arab and Haredi communities earn unreported income as part of Israel’s substantial gray market. When the institute shifted its focus to the more reliable index of family income, it found Israel’s real poverty rate was 12 per cent of households, not 20 per cent. Still, housing and food prices are high. Most importantly, the steady growth of Jewish settlements in the territory occupied by Israel since 1967 is seen by the Palestinian leadership and a growing segment of the world community as jeopardizing the two-states-for-two-peoples solution. The boycott, divestment and sanctions movement is slowly gaining steam, with the United Church of Canada the latest to sign on and the government of South Africa insisting that all goods made in the territories be labeled as such. But walking in Jerusalem, we saw a different Israel. Among the most lasting images are from the vibrant downtown, which is serviced by a light train. 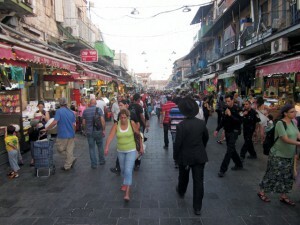 An older area of West Jerusalem around Zion Square is a pedestrian mall, and day and night it is filled with friendly, busy shoppers. Orthodox, secular Jews and Arab residents jostle in shops for the same bargains and sit side-by-side, if at separate tables, enjoying ice cream and coffee in the same cafés. There are more similarities, at least in their dress codes, between hijab-clad Arab women and their Hasidic counterparts than the latter have with their secular co-religionists. Of course, this is no Valhalla. There is plenty of hatred on both sides. Shortly after our time there, a group of Jewish teens attacked three young Arabs in the Zion Square area and a crowd stood by and did nothing. One ended up losing consciousness, and had to be revived. Such attacks have happened before, and there have been instances when Jews have been attacked in the Old City. Among the so-called hilltop youth in the territories, Jewish zealots harass and attack their Palestinian neighbours, and critics maintain the army and police fail to act with sufficient vigour, or do so reluctantly. These acts are not happening in a vacuum. There have been murderous acts of terror against settlers. Extremists among them have launched a so-called “price-tag” series of reprisals against Palestinians, their olive trees and mosques. Many of them believe the West Bank is part of the Promised Land. Palestinians who have lived there and worked the land for generations see the settlers as encroachers, or worse. He bemoaned that this issue has ceased to be at the centre of national debates because of “a tacit agreement” between the governing party and the opposition Labour Party to led it slide. He calls for an Israel offering “equality and justice for Israelis, Palestinians and work migrants alike,” but that, he says, will require a return to the welfare state. Leading Palestinians refuse to recognize Israel as a Jewish state because they feel it undercuts the rights of 1.5 million Israeli Arabs. They continue to demand the right to return and insist a state of Palestine won’t include Jews. It takes two to tango. Finding an acceptable formula that satisfies Palestinian demands while mollifying Israel’s feeling of vulnerability with pre-1967 borders, will require painful concessions. Can Israel continue to be both democratic and Jewish? Can both sides make the leap of faith or will the status quo, with its imperfections, injustices, and outbreaks of violence continue, and for how long? Will West Bank Palestinians accept the status quo, as settlers hope, and their areas eventually become part of Jordan? An estimated 2.7 million Palestinians, or just under half the 6.2-milion population of Jordan (World Bank, 2011), consists of Palestinian refugees displaced in 1948 and 1967. Right-wing Israelis believe this is a de-facto Palestinian state. Many, including the Palestinian leadership and much of the world, disagree. Yet, sitting by the beach in Haifa on a moonlit night, strolling on the busy Tel Aviv boardwalk, and sitting in the heart of Jerusalem among thousands, we can only say lechayim/to life: Let there be peace and accommodation. Be the first to comment on "Analysis: Israel is thriving, but settlements cast a shadow"